MySQL is one of the most favoured relational databases that the open source community has adopted over the years. Since its takeover by Oracle and the fork by the team to the now open source variant MariaDB – everyone from enterprises to start-ups uses MySQL for their database needs. MySQL is a database which works on the basic tenets defined for Structured Query Language (SQL) systems. If one were to learn MySQL, there is no end to the depth to which you can keep exploring MySQL. So instead of listing all the various resources that are available for MySQL, an easier approach is to look at the purpose for which we want to learn MySQL. Business Analysis often involves looking at data and identifying patterns which otherwise would not be that obvious. It means extracting data from different sources, merging them together in some form of a data warehouse and then creating different visualizations for the ease of sense-making. Clearly, one skill set that you need for this is the ability to visualize data. The other, and I believe this to be slightly more crucial than the former, is the ability to analyze data. MySQL is purely a relational database – which means most data stored in this data is stored in the form of rows in tables, each table being mapped to a real-world object or a class. Depending on what level of normalization made during the database design, the method of extracting data would change in varying degrees of difficulty. Let me explain the above statement a bit more clearly. 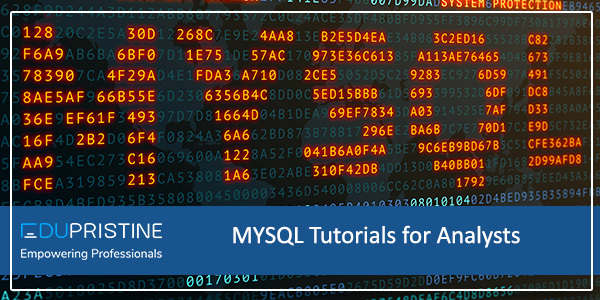 MySQL uses structured queries (since its SQL), to extract and manipulate data stored in tables. Understand the queries and how to write queries for analysts is important. Half the job in data analysis involves cleaning and structuring the data that you are going to analyze — thus these queries and the ability to write queries is super crucial. If your input is incorrect, your output will also contain a lot of errors. If an analyst knows MySQL, then he/she would be able to extract the correct data. What tools and tutorials can therefore a business analyst need that will help him do this better? One of the foundational books which clearly explains the reason behind SQL and how the underlying relational database works is an old engineering textbook called Database System Concepts by Abraham Silberschatz and Hank Korth (often referred to as just Korth). If you want to understand the reason why the world moved towards redundancy and normalization, how languages work, and what different types of queries and joins are available in a typical SQL system, this is the book to read. Who better to learn a system from than the makers of the system themselves? The MySQL developer documentation contains a lot of detailed notes painstakingly and lovingly compiled together for the entire world to use. Just follow this link for the tutorial for the latest MySQL version. If you do not wish to keep browsing pages, they even have a downloadable PDF that you can go through offline and keep for reference. One of the most commonly found sources of tutorial is the W3C site. It contains simple introduction to the subject and keeps building the concepts on top of those. If you are feeling slightly lazy and do not wish to read so many pages of MySQL tutorials, then I’d suggest you take a look at some of the more popular video sites and course sites e.g. YouTube, Udemy, Coursera, etc. What you need to search for on each of these sites is “MySQL tutorials”. Here are some links that I would look at – the official list of MySQL tutorials on YouTube. That pretty much sums it up, folks! In case if you have questions or queries on how better to learn MySQL, feel free to look at the MySQL Community site on the official MySQL.com site and post there. For those of you who are interested in the application of MySQL in Business Analysis and how can that data can be used to visualize better, feel free to reach out to us via the form on this page and our counsellors will contact you!